and if we can't help you, we'll happily recommend another Barn Dance Band - with no agency fees to pay! Why do I want a Barn Dance anyway? Barn Dance, Ceilidh, Hoe-down - which do I want? Barn Dances concentrate on traditional English dances. Ceilidhs include more energetic dances and louder music. 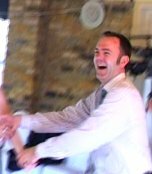 Scottish ceilidhs include some of the popular simple Scottish dances, such as 'The Gay Gordons' and 'The Dashing White Sergeant'. Kilts entirely optional! Hoe-downs include American square-dance and contra-dance figures. But don't worry about the technicalities; we'll be happy to help you choose the style of event best suited to you and your guests, and can even adapt the programme during the event where appropriate. What happens during the Barn Dance? Barn Dances often start about 8pm, and go on for about 3 hours including breaks, but we can usually cater for most other times (daytime or evening, 7 days a week). The band and caller will arrive about half an hour beforehand, in time to set up their amplification and instruments. The band holds Public Liability Insurance to safeguard your guests, and all the equipment is regularly safety-tested (P.A.T) - often obligatory when hiring public halls. The caller will enquire if there are other items to take place during the event, eg. refreshment break, raffle, speech from the happy couple. The caller will adapt the Barn Dance programme to accommodate these extra items. When everyone's ready the caller invites people - in a pleasant and encouraging way - to come onto the dance floor, and explains the steps of the dances in non-technical terms. The instructions are repeated as the music plays - so you don't have to be Brain-of-Britain and remember it all. As the evening progresses, the caller will assess the experience-level (and possibly the alcohol-level) of the dancers and adapt the programme accordingly from a wide repertoire of dances and music. A short break is usually appropriate about half-way through the evening. This is an excellent time to serve any refreshments you had planned. During the break this the band can provide recorded background music on request. Requests from the dancers for their 'favourite Barn Dance' - e.g. 'Strip the Willow' - will be incorporated into the programme where practical. How should I prepare for my Barn Dance? Your primary job is to provide a hall full of fun-loving adults and children, who are looking forward to a great evening's entertainment. You should consider whether refreshments are to be provided, and make appropriate arrangements. Similarly consider if a bar is required. At the start of the evening advise us what other items you intend to take place during the evening - speeches, presentations, etc - so the caller can plan accordingly. Try to find time to join in the fun with all the guests. We will be happy to discuss your plans with you, and advise on the best way to run the evening. Ring us - or email - to see which dates we have available. Please note we sometimes have commitments to dates more than two years ahead, so early booking is advisable if you have a specific date in mind. We'll be very pleased to talk through with you the plans for your event. Where appropriate we can do this 'face-to-face' via Skype video link. If you wish we can then put the date provisionally in our diary - without in any way committing you. When the rest of your arrangements are in order, contact us again to complete the details. We'll send you a simple, short booking form, summarising the requirements as we understand them. You check over and sign the booking form, and return it to us - no deposit necessary. We will mark the event as 'definite' in the band diary, and reply to you that it's all confirmed. If your event is open to the general public we can publicise it for you on the 'local Barn Dances' section of our website, if you wish. But of course it's 'no publicity' until you specifically tell us otherwise. On request we can usually arrange for you to visit another of our Barn Dances or festival appearances local to your area, where you can meet us and get a taste of what we offer. The Cat's Whiskers Barn Dance Band usually comprises three musicians playing fiddle, accordion and keyboard (sometimes a few other things too), but we can provide more or less musicians as required. We have over 70 years experience of music making between us, and a similar time spent on the dance floor learning to appreciate good dance sound. Does this make us each over 140 years old? - not yet! 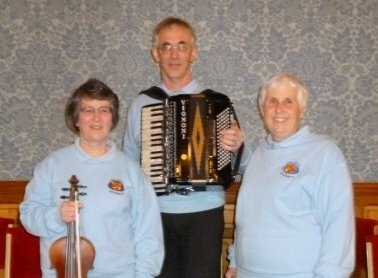 We have played many times at the country's top folk dance clubs and festivals, including Sidmouth, Whitby, Broadstairs, Eastbourne, Chippenham, Bromyard, Lichfield, Southam and at the national centres for English traditional dance (Cecil Sharp House in London, Halsway Manor in Somerset). Occasionally with teams of experienced dancers we attend overseas dance festivals (Denmark, France, Spain). We have worked with many of the country's top callers, and with guests from Europe and America. Once we understand the background to your event we will select the caller most suitable for you, and make all the arrangements on your behalf. 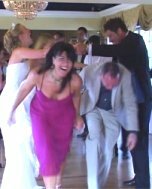 Here you can download descriptions of some popular Barn Dances, together with associated computer generated music files (MP3 and MIDI formats) and the music score in Noteworthy Composer and ABC formats. Most of the music is fully orchestrated for melody, rhythm, bass, counter-tune, and of the length and speed usually associated with the dance, so you could use it successfully to run your own Barn Dance.